The new Active Fill Control on Deere SPFHs allows for automated vehicle acquisition and more precise filling of trucks and wagons. 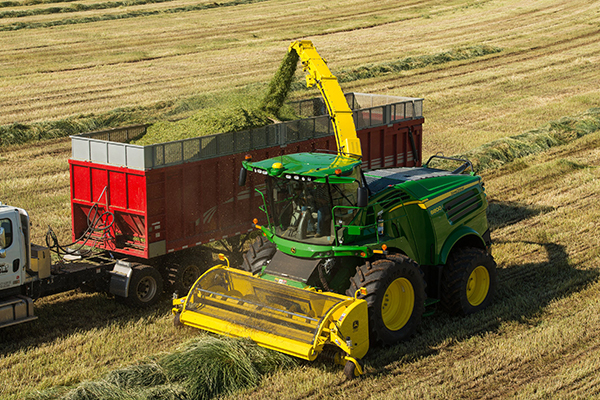 John Deere announces the addition of three new models to its lineup of 8000 Series Self-Propelled Forage Harvesters. These machines offer forage producers more productivity, increased uptime, decreased cost of operation, and are designed with the latest forage harvesting technology. "We took the momentum from the 8000 Series rollout last year and added to an already stellar lineup of forage harvesters," says Tim Meister, division manager, marketing with John Deere. "The three new models make the John Deere SPFH lineup even stronger with the ability to deliver optimal harvesting speed, reliability and forage quality." Each model can be equipped with HarvestLab™, an advanced crop analysis and documentation component that uses constituent sensing to improve forage quality. 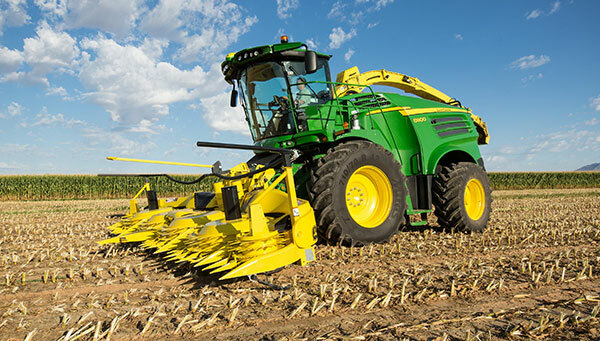 Headers for the SPFH machines include the John Deere Small Drum Rotary Harvesting units from 6-12 rows, John Deere Large Drum Rotary Harvesting units from 6-10 rows, and the all-new 9 Series Hay Pick-ups. All the John Deere headers are automatically speed-matched to the length of cut. Other features include the DuraDrum™ cutterhead with reverse sharpening and other technologies to improve forage processing and nutrient quality. Improved capacity adds another element to the performance of the new 8000 Series. The channel width is matched to engine horsepower, which customizes capacity to customer needs. Also included is a new spout design and turning mechanism, which allow for higher speed of operation and increased productivity. Another new feature, John Deere Active Fill Control, increases productivity and accuracy in the field. This new capability allows for automated filling of trucks and wagons, which results in reduced operator fatigue and crop losses. Other available features include a dual tire option for reduced soil compaction and better traction in wet soil conditions, lengthened service cycles, reduced daily maintenance and cleaning needs, and a new and innovative stone detection system. Three new models are added to the Deere SPFH lineup to deliver optimal harvesting speed, reliability and forage quality. Finally, the new 8000 Series models provide forage producers with a more efficient cost of operation with improved fuel efficiency - up to six percent (gallons per ton) in corn and up to 15 percent (gallons per ton) in grass. When packaged alongside the stronger design and higher horsepower performance, these machines will provide years of reliable service. "Our goal was to deliver an efficient, high-performing self-propelled forage harvester that producers could rely on year-in and year-out," adds Meister. "The new 8000 Series models do just that, and provide innovative technology to help producers run more efficiently in the field." To learn more about the new 8000 Series self-propelled forage harvester models, visit your local John Deere dealer or visit www.JohnDeere.com/Ag.